Here is our last update for August! Two of the American Express Air Miles cards were updated today. 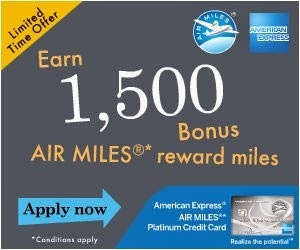 The American Express Air Miles Platinum has had its sign up bonus increased to 1,500 miles while the Air Miles Reserve has dropped from 2,500 to 1,700. Both cards still have the same spend requirements to earn those bonuses. Of course the Air Miles Platinum comes first year free so those 1,500 Miles are essentially 'free miles' as long as you use the card on spend that you were going to complete anyways. See the bonus offer section for more details. - 1,700 Bonus AIR MILES reward miles when you charge a total of $3,000 in purchases to your Card within your first three months of Cardmembership with the American Express® Air Miles® Reserve Card. More... Until ? - 1,500 Bonus AIR MILES reward miles when you charge a total of $500 in purchases to your Card within your first three months of Cardmembership with the The American Express® AIR MILES®* Platinum Credit Card More... Until ?